Jaguar's XF: the ultimate in music on the move? Calling all petrolheads: the world's best known loudspeaker manufacturer, Bowers & Wilkins, has finally got its class-leading speakers into a production car. 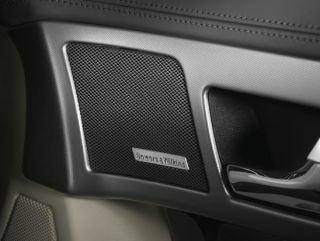 The Worthing-based company has agreed on a 14-speaker sound system to be fitted to the top-of-the-range Jaguar XF - the company's new luxury saloon car. B&W and Jaguar have been collaborating on incorporating B&W's audio know-how into the latter's luxury cars since 2004. Earlier this year, the two companies unveiled the C-XF concept car and it's this showcase car that spawned the road-going XF. Inside, the system comprises four metal dome tweeters, an incredible nine Kevlar midrange units, and a subwoofer. It's driven by a Dolby Pro Music II 7.1-channel audio system that powers the specially tailored drive units. The system - which is a £2,000 add-on - is the first instance of a car maker changing the shape of the chassis to accommodate an audio system. Boot space was actually created to house the subwoofer! According to Bowers & Wilkins' Martin Lindsay: "great cars need an audio experience to match". It is said the Dolby system aims to give both driver and passengers good imaging - even in the back.